Play Jackpot Diamonds™ online for free now! 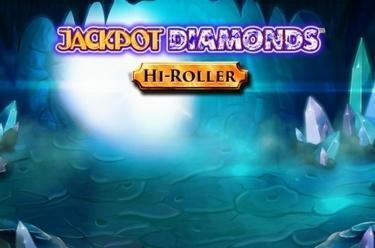 Gems galore, two Jackpots and two Highroller modes – in short, Jackpot Diamonds™ offers you endless chances to win big! The more you bet in the ‘Hi Roller’ feature, the bigger your winnings will be during the Lock and Spin bonus, which fixates the jewels on the reels and enables even more lucrative combinations. It takes just a bit of luck to also win the jackpots – just gather some diamonds or rubies to trigger a flood of glittering winnings! 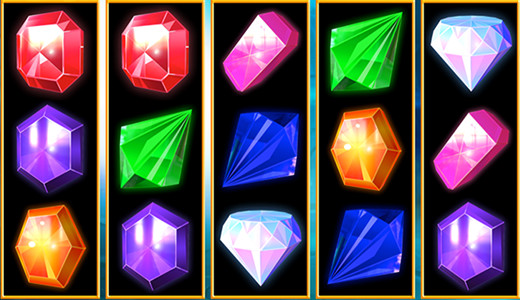 Your aim at Jackpot Diamonds™ is to achieve 5 valuable gems one of the 10 win lines without any interruption. The winning pattern always begins on the leftmost reel and runs all the way to the rightmost one. It takes a reel-set full of diamonds or rubies to win the respective progressive jackpot. The Lock and Spin bonus activates after every win. All symbols which are part of the winning combination will be fixed on the reels while the remaining symbols spin again. The symbols which are added to the winning combination after that spin are held again and another spin is initiated. The feature only ends if no more symbols appear which contribute to the winning combination. You will then receive your winnings and be returned to the regular game. The Hi Roller feature can be activated via the game settings. You can choose whether you want to bet 5 times (High Roller silver) or 10 times (High Roller gold) your stake. During the feature you’ll be able to see a winning multiplier above the reel-set: as soon as the Lock and Spin bonus begins, your wins will be multiplied according to the multiplier at that time. The multiplier will also increase with every spin which includes symbols that complete a winning combination. (max. x8 for silver and x16 for gold).